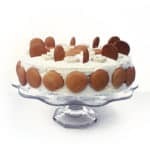 This sumptuous Tiramisu Trifle makes a statement for any party! 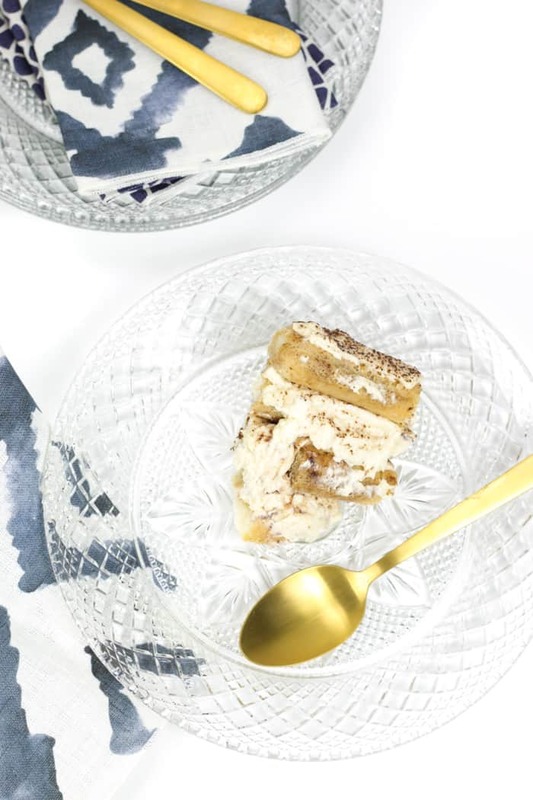 Layers upon layers of espresso-soaked Italian ladyfinger cookies and tiramisu cream make for a show-stopping dessert. Every good party needs a signature something. Whether it’s a fancy cocktail, an addictive appetizer or a stunner of a dessert, you want to send your guests home with something to talk about. 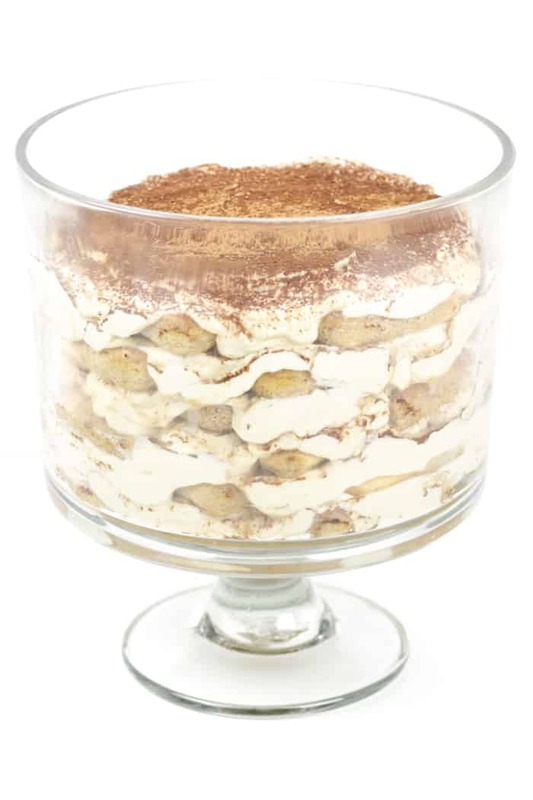 Enter this Tiramisu Trifle. It’s just like tiramisu, only there are more layers of heaven. I tried my first bite of tiramisu at a fancy restaurant with my parents once as a kid, and was decidedly not a fan. But I tried it again in my early 20s, a newfound lover of both coffee and booze, and was sold. 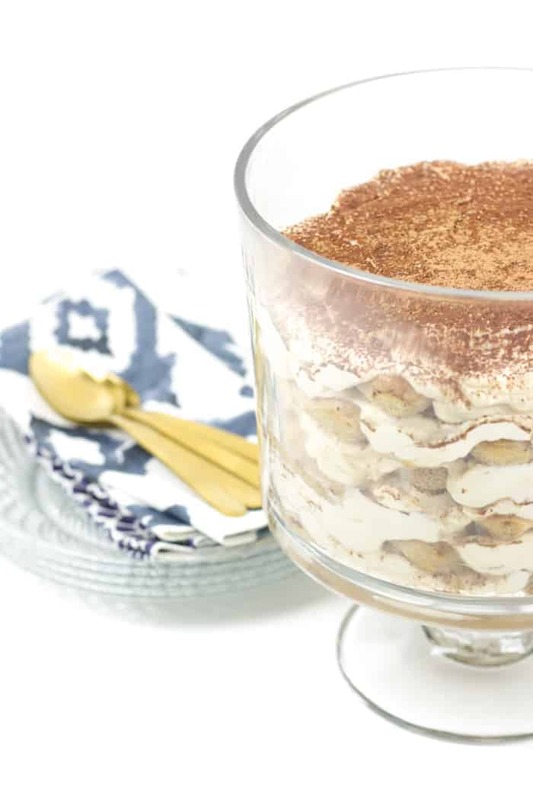 Tiramisu is a sweet, layered Italian dessert. On the bottom is a layer of savoiardi or ladyfinger cookies that have been soaked in espresso and booze, often coffee liqueur. The next layer is a mixture of whipped cream, mascarpone cheese and zabaglione, which is a cooked mixture of egg, sugar and booze. And each layer is dusted with cocoa powder. Repeat the layers a few times. Always make it a few hours ahead of when you’ll need it so the savoiardi cookies will become soaked through with the coffee and liqueur to make a creamy dessert. So very blissful. And so decadent. 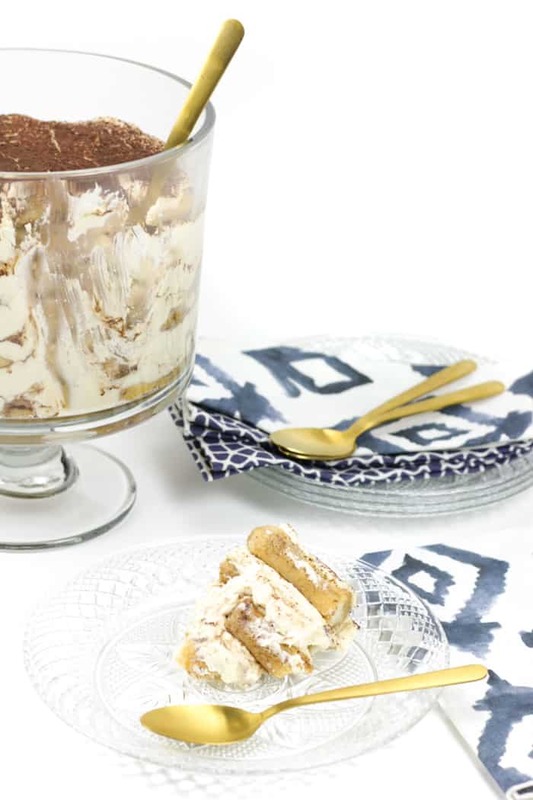 The biggest difference between a regular tiramisu and this Tiramisu Trifle? The dish it’s served in. 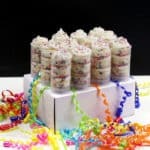 Trifles are beautiful, layered desserts that make a statement at parties. They are usually served in a trifle bowl, which is a wide bowl with a stand on the bottom. Sometimes they have fancy lids, too. 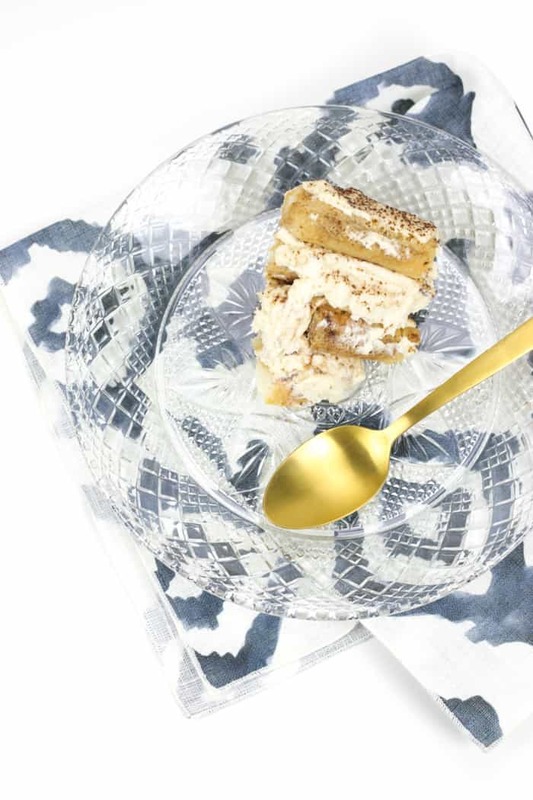 I love how this Tiramisu Trifle adds a little height to a tablescape of party food! 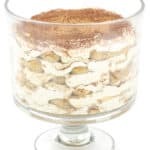 Plus, a quick recall of fourth grade volume math will tell you that a deeper container allows for more layers of sumptuous, luscious tiramisu. Ladyfinger cookies or savoiardi are long, oval-shaped sponge cookies. They are called ladyfingers because, well, they kind of resemble long fingers. Ladyfingers are made from a sponge cake batter that is then piped onto a baking sheet to create the “finger” shape. Before baking, they’re dusted with powdered sugar to give them a bit of a sweet crust. If you have ever made homemade ladyfingers, you’ll know that they tend to be much softer and more pliable than store-bought ladyfingers. While you’re welcome to make your own ladyfingers for Tiramisu Trifle, store-bought savoiardi will be just fine. Ladyfingers are pretty easy to find at just about any grocery store. Just take a look in the cookie aisle. Of course, you can also find them online. If you’re really lucky, you may even have a local bakery that makes and sells fresh ladyfingers. This would be the best of both worlds: the softness and freshness of homemade ladyfingers, with the ease of store-bought. While many people assume that you have to use coffee liqueur in tiramisu, there are actually a few different liqueur options! Marsala wine is traditional to tiramisu and would be delicious in Tiramisu Trifle, but you could also use dark rum, port, brandy, Madeira or even Irish cream liqueur. Make the zabaglione. In a saucepan, fill 1/3 with water and bring to a boil. While you wait, find a double-boiler to fit over the top. You can use a mixing bowl that will fit over the top without touching the water. While the bowl is not on the saucepan, add the 5 egg yolks to the mixing bowl. Whisk in 1/4 cup of sugar until the sugar is dissolved and the yolks turn pale in color. Transfer the bowl to the saucepan with the simmering water. Add 1/2 cup of liqueur (see note) to the egg mixture and whisk to combine. Scrape the bowl with a rubber spatula. Cook until thickened. Remove from heat. Cover bowl with plastic wrap and refrigerate until cool. Make the cream mixture. Add the mascarpone cheese to a mixing bowl and stir until smooth. In a stand mixer or a mixing bowl, whip together whipping cream and remaining 4 tablespoons sugar until almost stiff. Gently fold the mascarpone cheese into the whipped cream mixture. Then gently fold in the chilled zabaglione (egg yolk mixture). Cover with plastic wrap and chill in the refrigerator for 1 to 2 hours. Make the tiramisu.In a small bowl, combine brewed espresso, vanilla extract and remaining 1/4 cup liqueur. Arrange the ladyfingers in a single layer in the bottom of a trifle bowl. (You may need to cut some of the ladyfingers into smaller pieces to thoroughly fit in the circle.) Spoon slightly less than a tablespoon of the espresso mixture over each ladyfinger cookie. Smoothly spread a layer of the cream mixture onto the ladyfingers. Sift a layer of cocoa powder over top. Repeat layers 6-8 times with ladyfingers, espresso, cream, cocoa powder. (My trifle had 7 layers of each.) Cover and refrigerate for 2-4 hours to allow the cookies to soften. To serve, spoon out helpings onto plates. Store covered in the refrigerator for up to 2 days. For the liqueur, Marsala wine is traditionally used. 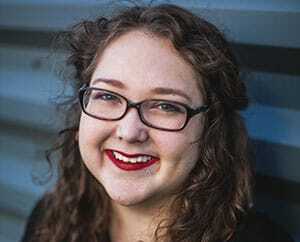 But you can also substitute coffee liqueur, dark rum (Kraken is my favorite! ), port, brandy, Madeira or Irish cream. Each will bring a different flavor, so experiment and see what you like! 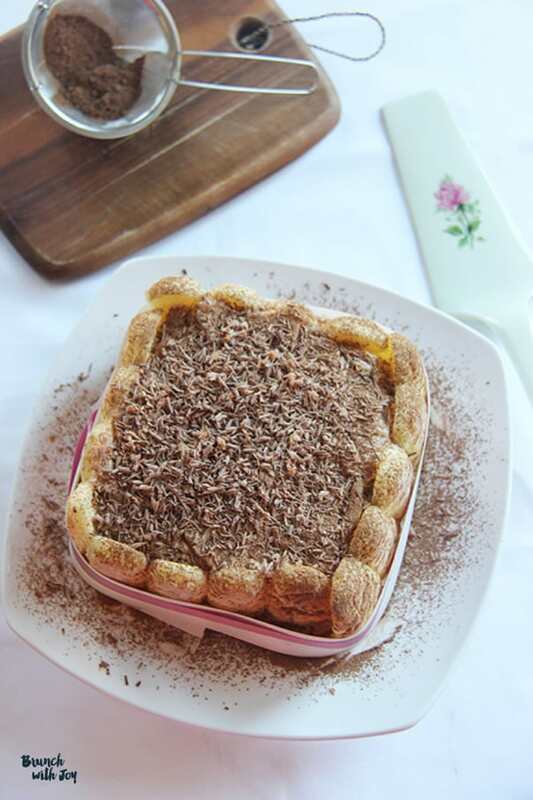 Love tiramisu? 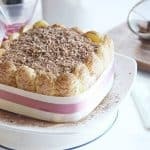 Try this Tiramisu Ice Cream Cake, a guest post from my friend Linda at Brunch ‘n Bites! What a splendid tiramisu recipe! Please tell me, do you put the egg mixture in the boiling water after eggs and sugar beaten?? What a fun dessert! And those plates are so cute! Always a classic. I love tiramisu. One of my favorite desserts for sure! I agree! Classic never goes out of style. Tiramisu is my mother-in-law’s favorite! – She will love this recipe, for sure. Your mother-in-low knows what’s up! Thanks for your comment, Elise! Yum! I love trifles for the very reason you mentioned: More layers of goodness. This one looks perfect! Yes! So many luscious layers! Thanks for stopping by, Abby! YUM!! And I am loving those plates! Thank you, Elizabeth! I love those plates too! 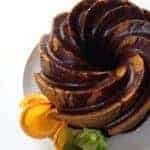 One of my favorite desserts made in a brilliant way! Layers on layers on layers! Thanks for stopping by, Brandi! Love, love, love this recipe! Like you, I didn’t like Tiramisu as a kid, but once adulthood hit, and I tried again, I realized it was alllllllll good things. Here’s to trifles and the summertime and gorgeous desserts like this one! 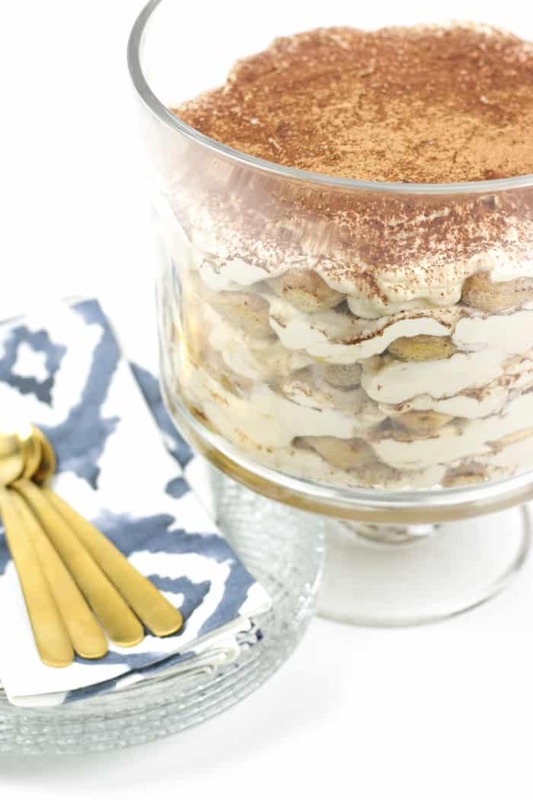 A tiramisu trifle is such a good idea! I have a trifle bowl that I don’t use nearly enough. This is a good way to break it out again! Thanks Jenna! You totally need to break out your trifle dish! This dessert would be perfect. Right? Trifles are so underrated. But so delicious. The perfect excuse to use up ugly brownies and cakes and such! Thanks so much for your comment, Grace! Such a lovely tiramisu recipe, Susannah! Must prepare this for weekend! Thank you so much, Agnes! I am sorry I am so late seeing this, but I hope you enjoyed it! I made this unlike most of the comments here who seem to be the same people commenting over and over! Anyway the zabaglione curdled and I had to ditch the mixture….wasted a lb of mascarpone. Improvised with flavoured cream which I whisked with coffee and chocolate to make a mocha trifle instead….won’t be trying this one again. So sorry to hear this, Rach. Without knowing exactly what happened, it sounds like your eggs may have overcooked or that you overwhipped the mascarpone. It happens sometimes! I recently botched a whole batch of homemade ice cream. Made a giant batch of this for a party. It was delicious! It’s creamy and rich, but not overly sweet. It received rave reviews. Definitely a keeper. OK, I looked at this and thought what a perfect surprise for my daughters birthday. I finally found lady fingers thru youngest daughter at the world store. I had her pick up two packages. I started to make and decided on Kahlua for the liquor. While taking care of whisking the eggs and sugar, I knocked the bottle, large on the floor. It broke in a hundred pieces. My neighbor had more and I was in tears. I put all the creamy stuff in the frig as directed. Now it was midnight. I decided to put the rest together in the morning. I started early with the extra strong coffee my son in law made for me. He sent it in a sealed canning jar. While removing cap it flew out of my hands and into the sink, all of it. OK, I made my own coffee, added Kahlua and vanilla. I started putting together and prayed. IT Was The Best Dessert Ever. I did use almost pkgs of lady fingers. It’s a Big Hit. Thank You. Can part cream cheese be used instead of all Mascarpone? Mascarpone is so expensive? Hey Marg! You definitely can. While marscapone is more authentic for tiramisu, you can absolutely use cream cheese if you combine it with whipping cream. I’ve never done it myself, so I would definitely research the right ratio for the substitution. I hope that helps! Hi! I will be making this for my MIl’s birthday. How far in advance can I make this? I would say for the best, freshest taste you should make it no more than a day in advance. It does keep for longer, but I think it tastes best the first and second days. Hope she enjoys!